Support Home Paya Exchange Products Paya Exchange Desktop How do I use Sage Exchange Desktop Silent Installer? Starting with Sage Exchange Desktop 2.0.2.32 and greater we will offer a Silent Installer for an enterprise organization. This will allow Systems administrators to roll out upgrades and new installations through a pushed network installation (group policy.) This will allow IT teams, to prevent individual users from updating without the proper user permission, and does not require any user input. Please note: If you think that this solution will fit your organization's needs please contact your systems administrator before attempting to use this solution. The Silent Install version of SED 2.0 is recommended for larger organizations who have admin restrictions at the user/workstation level. It is also useful for enterprise organizations who have the ability to push network installation (group policy). The Silent Install version does not update automatically. SED 2.0 Silent Installation is a Windows Installer file (a file with MSI extension) that internally uses existing standard SED 2.0 installation process but does not require any user input. 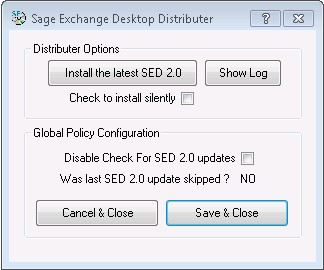 Download the SED 2.0 Silent Installation file from https://www.sageexchange.com/install. 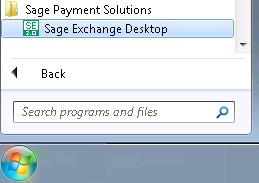 Scroll down to the Silent Installation section and click Download Installer in the Sage Exchange Desktop Distributor row. Run the file when it has finished downloading. The file installs the latest version of SED 2.0 without displaying any user interface. No additional user actions are required during the installation. Install SED 2.0 in attended and unattended/silent modes. Check whether a user skipped the last SED 2.0 update. Enable and disable the SED 2.0 update check that is usually performed when the application launches. Select the appropriate options for your system and click Save & Close. /Quiet – Hides the UI and installs the latest available SED 2.0 without any user interaction. /EnableSEDUpdate - Enables SED 2.0 check for updates every time SED 2.0 starts. /DisableSEDUpdate - Disables SED 2.0 check for updates every time SED 2.0 starts.